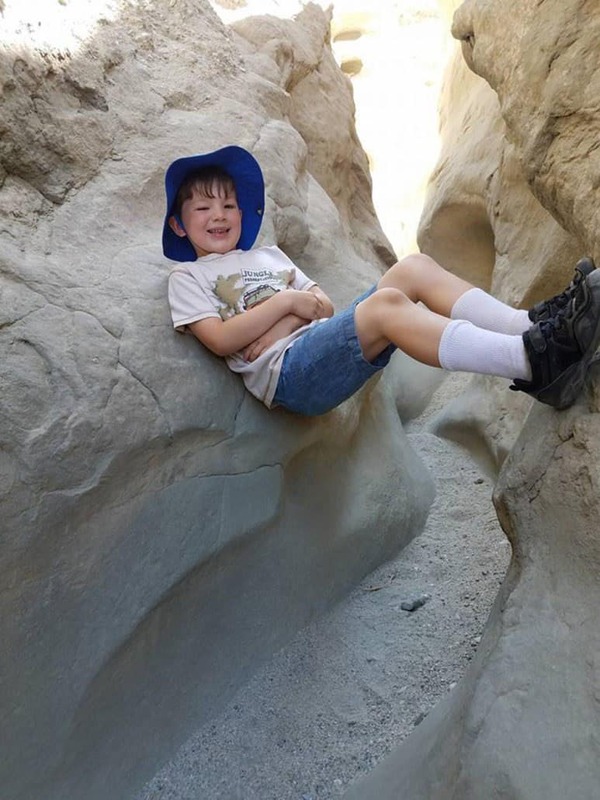 Whether exploring the golf courses in Indian Wells, the water park in Cathedral City, the zoo in Palm Desert or the aeriel tramway in Coachella Valley you’re sure to find adventure in Palm Springs with kids of all ages. 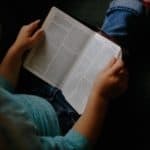 With a toddler, 6-year old and two teens in our family, finding activities that interest all of them can be a challenge. Occasionally when we’re on a family vacation, my husband and I have to divide up so that the big kids can do activities just for them. It’s worth it for some activities, as you’ll read. I’ve also included a list of activities that are family friendly and that young kids and adults alike will enjoy together! 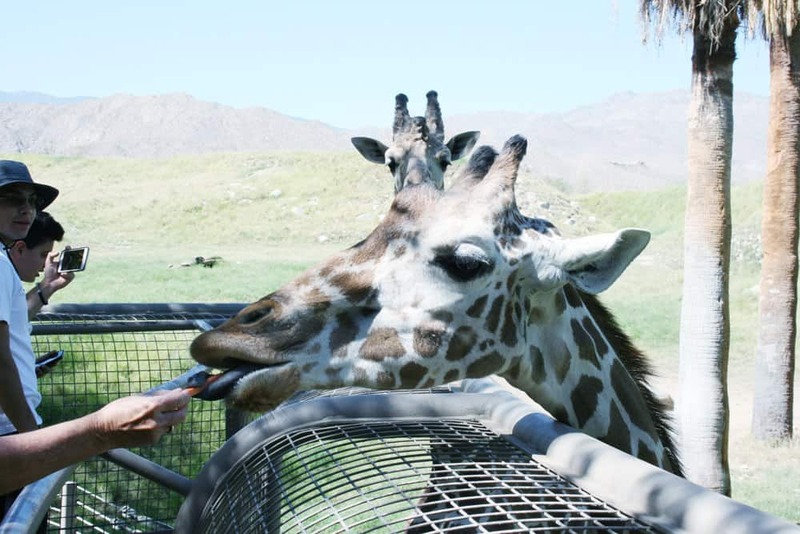 Visit Greater Palm Springs arranged complimentary admission to several of these activities (Living Desert, Children’s Discovery Museum, Wet n’ Wild Water Park & Red Jeep Tour). 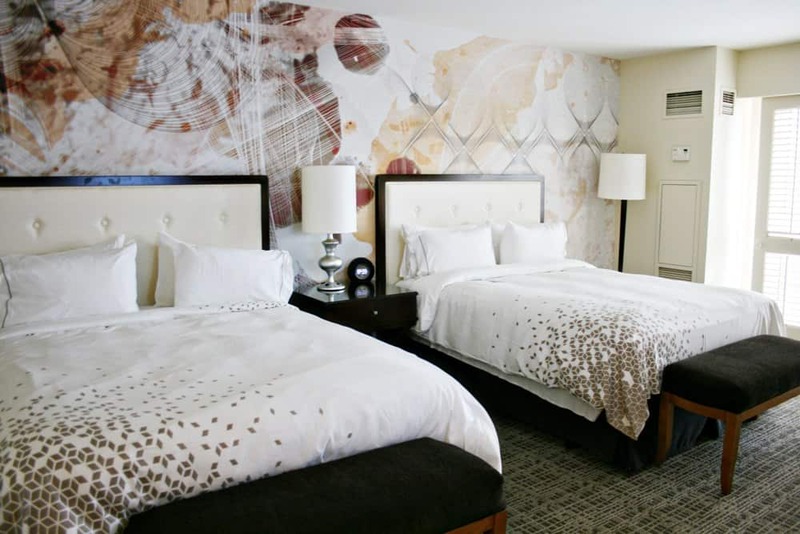 Renaissance Indian Wells provided lodging and dining credit. All opinions are my own. Please note that my posts contain affiliate links. Clicking through and making a purchase helps me in a small financial way, thank you! While my family of six has taken California road trips in the past, we’d never explored Palm Springs together. Palm Springs takes approximately 2.5 hours to drive from San Diego, though we did run into some traffic that extended the drive on a Friday afternoon. We stopped for healthy snacks at a convenience store along the way. 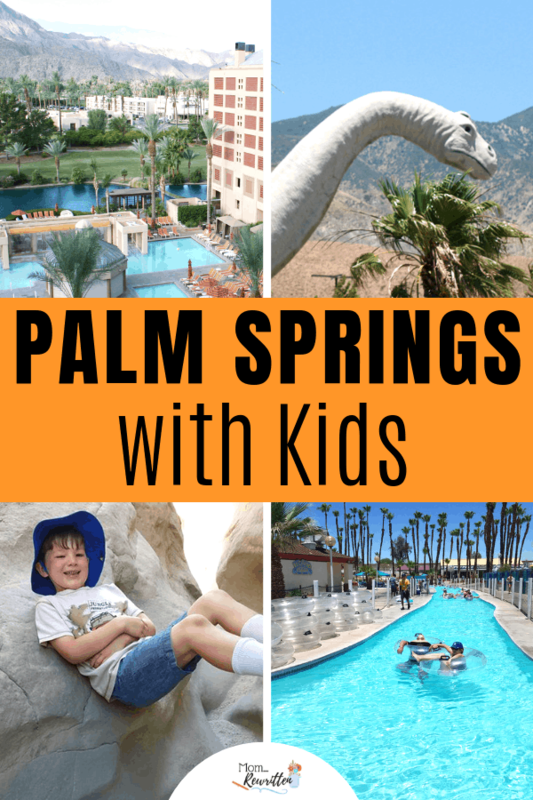 I’m sharing tips on where to stay and advice for lots of family activities when taking on Palm Springs with kids. 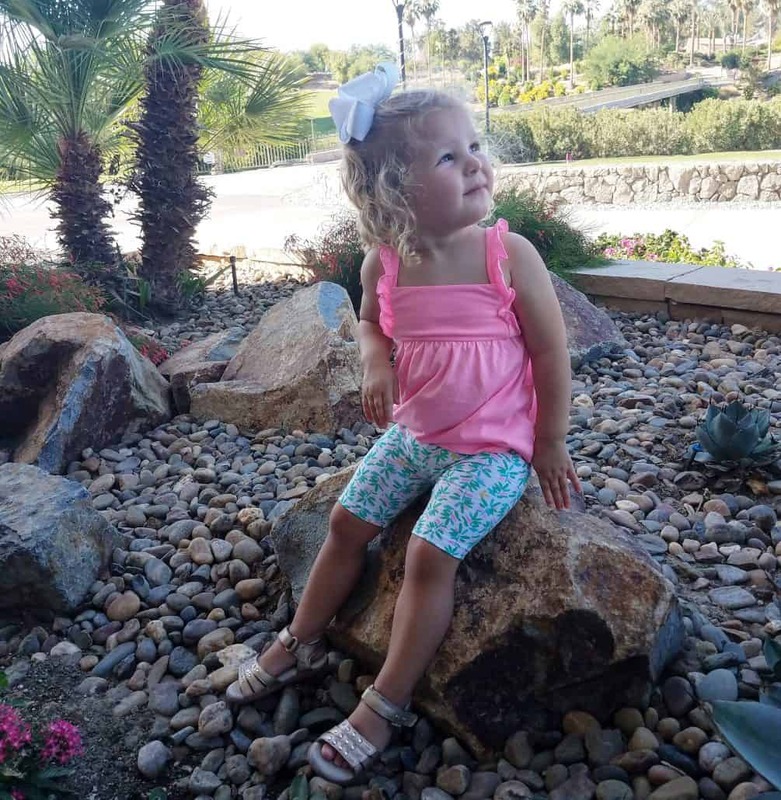 If you’re looking for a Palm Springs kid friendly resort that’s also classy and high in family-friendly amenities, the Renaissance Indian Wells is perfect all-around. From the moment we arrived, the staff made us feel welcome, telling us about the resort amenities (including complimentary bikes for touring the resort). My family of six were placed into a 1 bedroom Executive suite, with a connecting two Queen bed room. Each room had a private balcony with an incredible pool and mountain view. Seriously, it was gorgeous waking up to this view! The spaciousness of the rooms and the ability to close doors between the spaces was ideal. While my big kids slept and my husband watched television, I was able to sit with the toddler in the quiet living space until she fell asleep. Roomy queen bed room at the Renaissance Indian Wells. 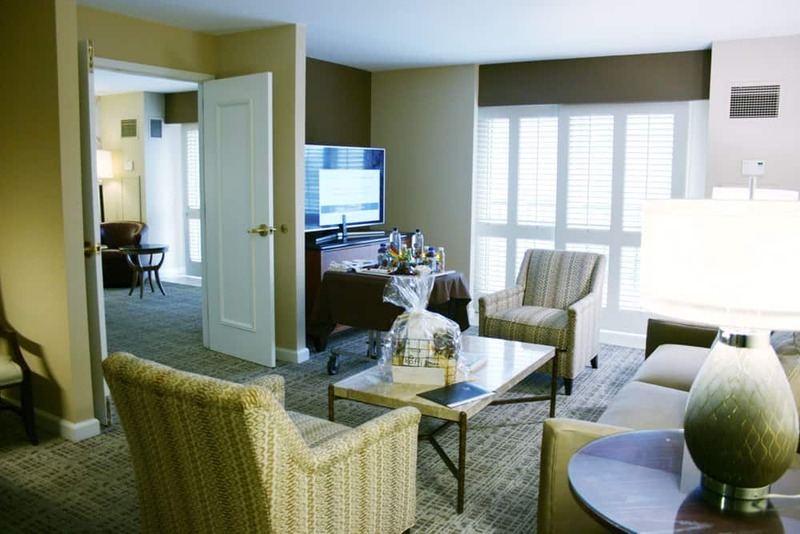 The spacious living room in the executive suite. 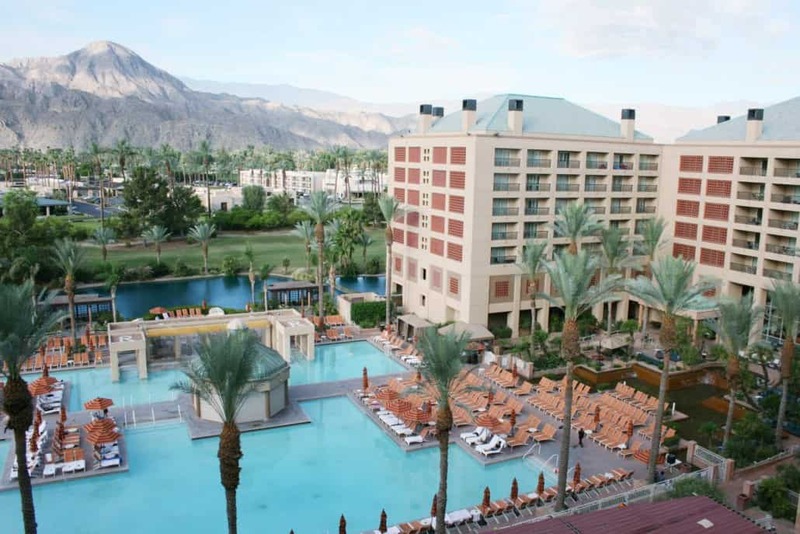 What’s for Families at the Renaissance Indian Wells? The large and beautiful pool at the Renaissance Indian Wells is a big draw for families. After my 6-year old got over the disappointment that the resort pool didn’t have a water slide, he consoled himself on the sandy beach and in one of the two hot tubs! The pool area does get extremely crowded during the day and it’s easy to lose track of the kids. Also there aren’t any lifeguards on duty, so keep a close eye. There are towels available poolside, but bring your own flotation device for non-swimmers. I had to do a Target run for our toddler to purchase one. The pool area is open very late which means if you have a pool view, you’re going to hear the noise. On one of the nights of our visit, there was an extremely loud “dive in movie” at the pool going on until nearly 10 pm. I recommend bringing ear plugs if you’re an early sleeper. A sleep mask is another good thing to pack as there were no blackout curtains in our room and the shutters didn’t fully block all the light. 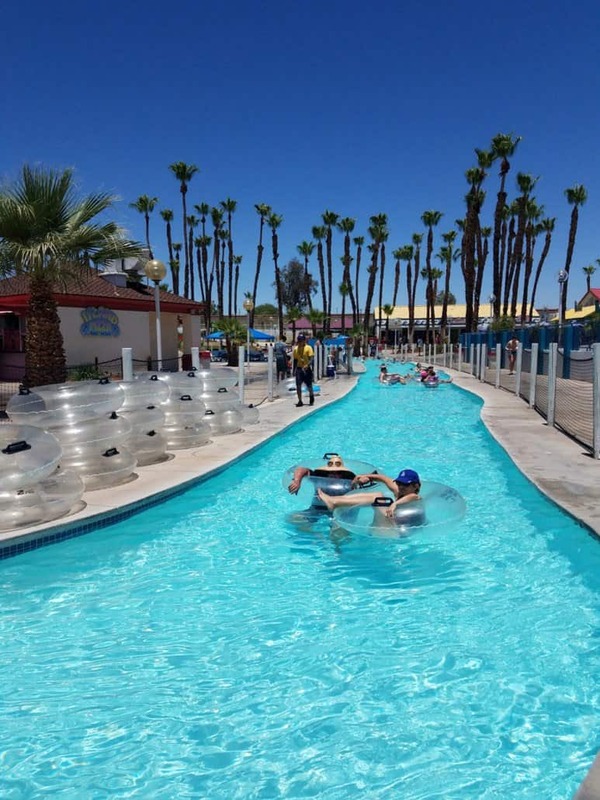 Fun for Grown-Ups in Palm Springs, Too! There’s plenty to do at the Renaissance Indian Wells without the kids too. Check the young ones (ages 4-13) into Camp Oasis for the morning or evening session (reservations are recommended). Then adults can enjoy the resort spa, Spa Esmeralda with a variety of pampering services and treatments. My husband let me sleep in with the kids one morning while he took advantage of the fitness center and free classes. 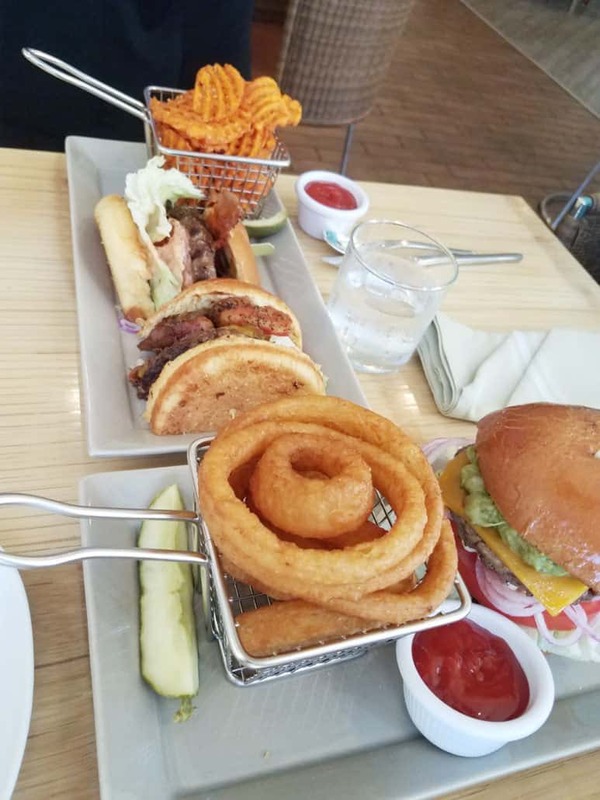 For dining, we enjoyed the unique and delicious burgers at CAVA for lunch. We found this location to be upscale but still comfortable enough for kids. There’s also Japanese specialties at Glo Sushi or Italian dining at Sirocco Pizza Company. Read my travel dining hacks with kids. A variety of burgers and fries to share at CAVA, Renaissance Indian Wells. The Palm Springs area is quite easy to navigate. The Renaissance Indian Wells is located towards the southern end of the Palm Desert area. Driving on the 111, we were able to access many of the family activities around Palm Springs within 30 minutes or so. As California natives we’ve done a lot of exploring outdoors in San Diego. Choose your vacation time wisely. We visited in early summer and the weather was quite warm. Summer can bring some extreme heat. If you’re not used to the warmth of the desert you’ll definitely have a few extra considerations. Use sunscreen and reapply a lot. Drink plenty of water to maintain hydration. Aim to avoid the direct sun mid-day, seeking indoor activities when the weather is hottest. While my husband and older kids took a guided tour on a jeep, my toddler and I explored at the Children’s Discovery Museum of the Desert. 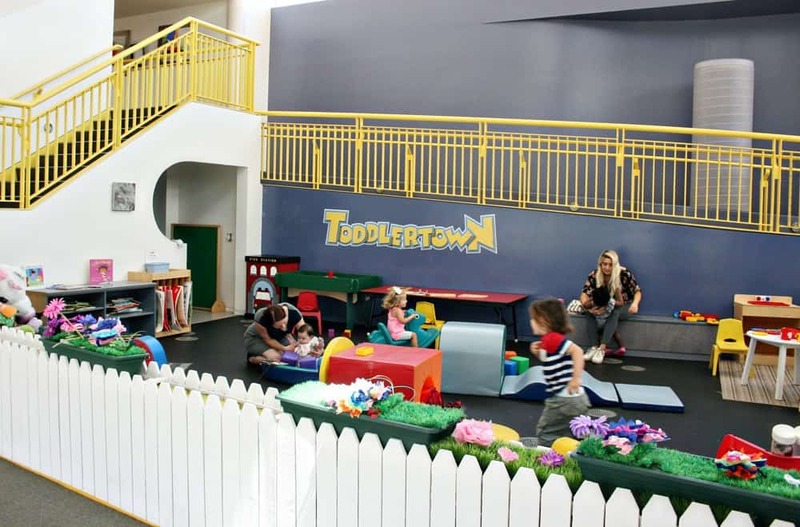 We’ve done children’s museums in San Diego before but I was thrilled by the unique variety of things for my toddler to do here! We definitely could have spent the entire day playing here, my daughter was having a wonderful time. 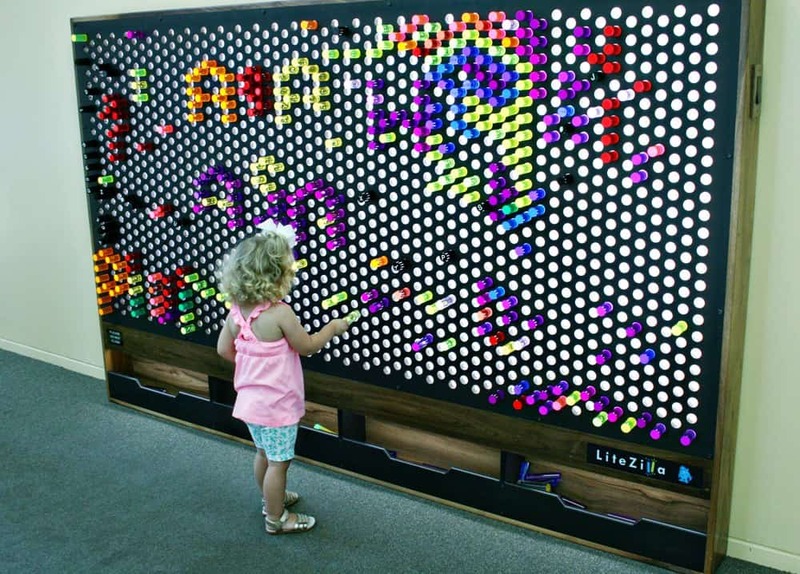 The Children’s Discovery Museum offers over 80 hands-on exhibits, some of which are traveling for a limited time. My daughter is recently 2 years old and I was pleased that there was so much she was able to do here. She happily played “veterinarian” to stuffed puppy dogs, shopped for groceries, tested how balls and silks could “balance” on air jets and had a tea party in Toddlertown. I know that my six year old son would have enjoyed the museum and some of the more scientific experiments as well. There are both indoor playgrounds and grassy areas outside (with balls and toys). There are also shaded picnic benches. When you enter into the main building be sure to head outside to visit the other galleries. Each of the buildings is air conditioned but you’ll be in the sun when walking between the galleries. Seating is limited for adults inside the galleries but that’s only to encourage grown ups to play alongside their kids! You might not think to pack the sunscreen for a museum but you’ll be walking outside between galleries. 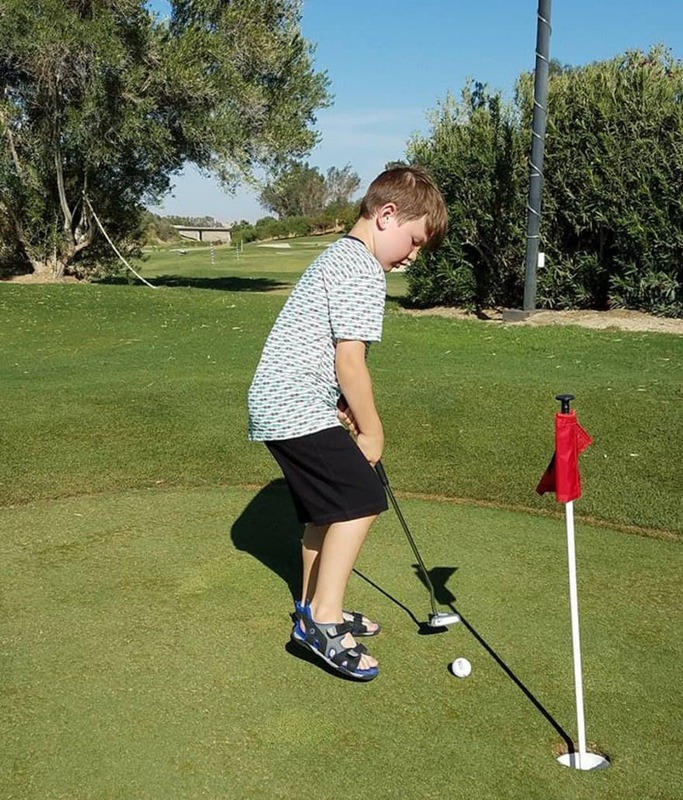 Palm Springs is known for their golf courses. But you might not think to take the kids! 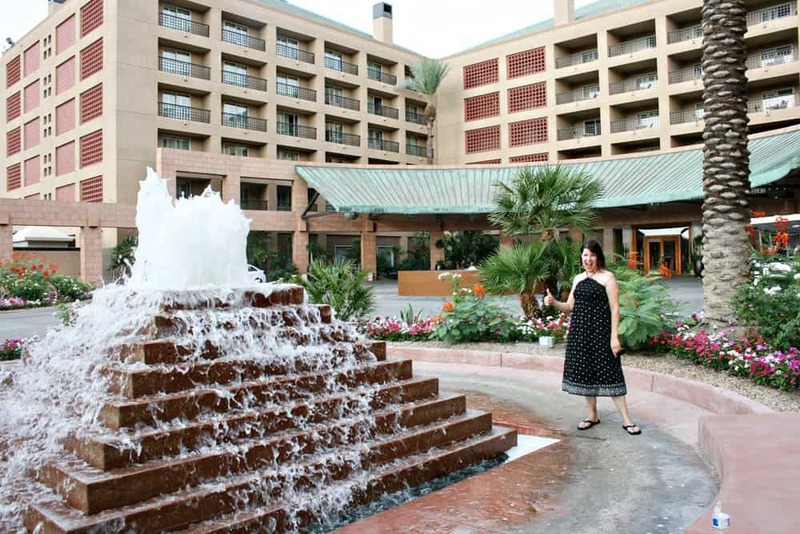 The Indian Wells Golf Resort is conveniently located right next door to the Renaissance Indian Wells resort. 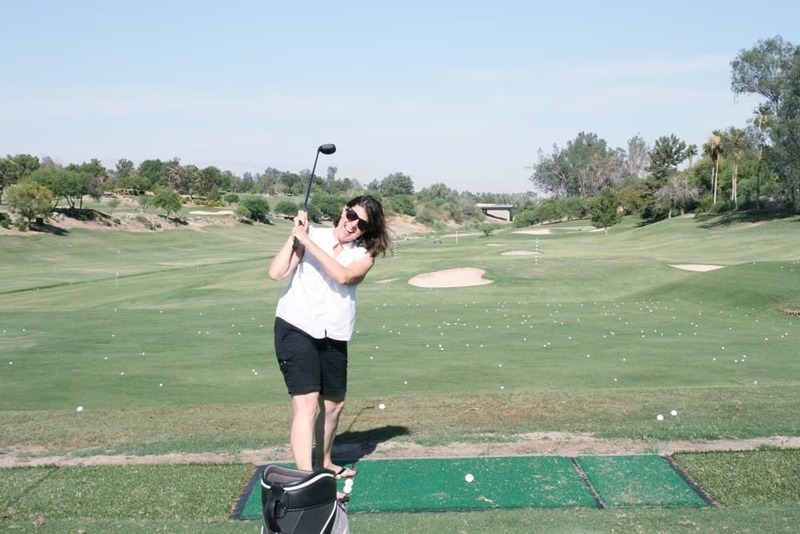 Guests of the Renaissance Indian Wells resort can practice putting or driving balls for free after noon! You don’t even need your own clubs or reservations, just show up. A complimentary shuttle transports guests back and forth. My older kids (and my husband!) were so excited to try “real” golfing for the first time. While my husband and older kids played, the toddler and I walked around the pretty resort, taking pictures of the landscaping. There is a grill and bar with food for purchase, and complimentary water to stay hydrated. I have to admit that I declined the offer to take the Palm Springs Ariel Tramway. My fear of heights got the best of me and I just knew I wouldn’t be able to take that ride! However if heights don’t bother you, I highly recommend taking the tramway and you can read more about it on this TravelingMom post. If you’re looking for a desert adventure, here are many tour companies that will take you on a Jeep tour of Joshua Tree National Park, Indian Canyons or Mecca Hills. 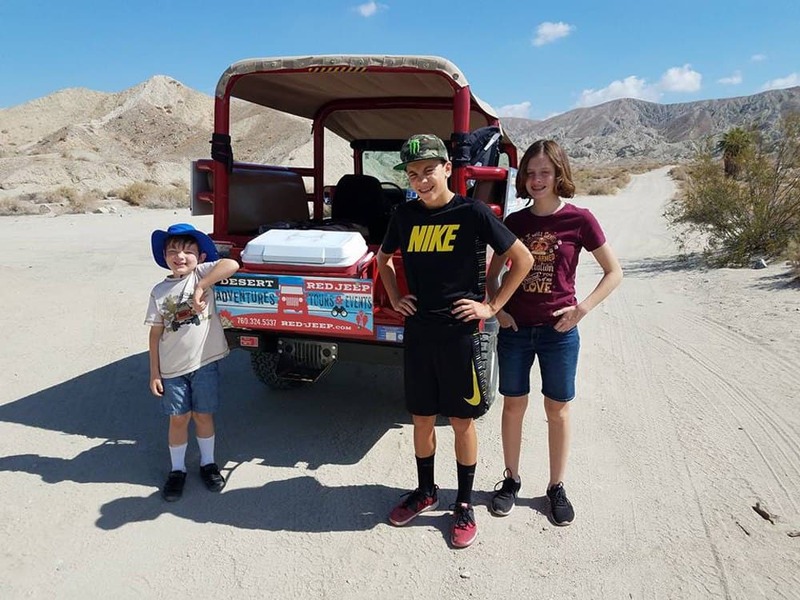 The San Andreas Fault Jeep tour is what my family took with Desert Adventure’s Red Jeep Tours. Complimentary hotel pickup is available for guests staying in Palm Desert or Indian Wells. I opted out of taking the toddler so my three older kids and husband took the Red Jeep Tour. Phil was their tour guide. He picked them up directly in front of our hotel, which was extremely convenient. If your child rides in a booster seat, you’ll need to install it into the Jeep. The tour takes place at the private Metate Ranch preserve on the San Andreas Fault. Phil tailored the private tour for my husband and kids. The tour visits an active earthquake fault system, which my teenagers thought was cool. My family learned about the Cahuilla Indians, about the plants and animals in the desert and saw a natural palm oasis with bubbling water from an underground aquifer. They also had time to explore in the deep canyons and take a brief hike. After panning for gold, my kids received a vial with some of the gold chips they’d discovered. I liked panning for gold. I learned about a fire in the palm trees and heard stories about the Indian spirit words. Mine was called “Bright Spirit”. I like when I got the Indian arrowhead at the end. It was a day to remember. I enjoyed the humor of our tour guide Phil and learning the history of Palm Springs. My favorite part was going to visit the reservoirs and see how they get water in the desert. With one of the world’s largest collections of flyable WWII aircraft the Palm Springs Air Museum will appeal to aviation fans and history buffs alike. My friend (and self-professed “aviation geek”) Leslie of Trips with Tykes talks more about the Palm Springs Air Museum. 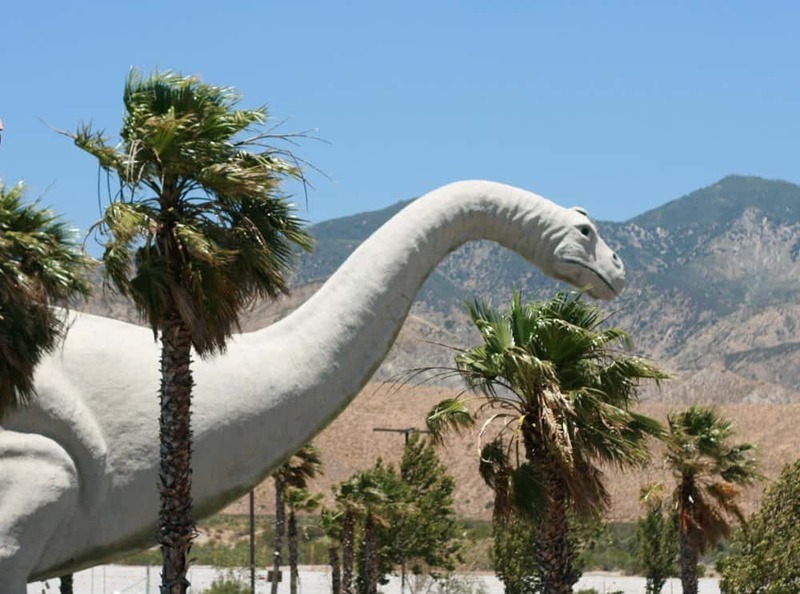 The Cabazon Dinosaurs are one of the quirkiest roadside attractions! Located along the 10 fwy, you can’t miss this collection of dino statues while driving into the Palm Springs area. If you’re a fan of the movie Pee-Wee’s Big Adventure you’ll recognize this area from one of the scenes. If you want to climb inside Mr. Rex’s mouth like Pee-Wee did, there’s a additional fee. Otherwise you can view and take photos of the other dinosaurs without any charge. As a San Diego native, I’m very familiar with our San Diego Zoo and didn’t know what to expect in Palm Springs. I was so pleased with our visit to the Living Desert Zoo! We visited early on Father’s Day and the crowds were very light, something I’m definitely not used to at the overly crowded San Diego Zoo. We were easily able to get close with the animals and linger as long as we wanted. I personally love the giraffes and it was incredible to be so close to them! You can even feed them for an additional fee. My husband and teens were excited to point out some of the plants in the botanical gardens, recognizing them from the jeep tour the day prior. There are 1,400 different species of plants here, all beautifully maintained. 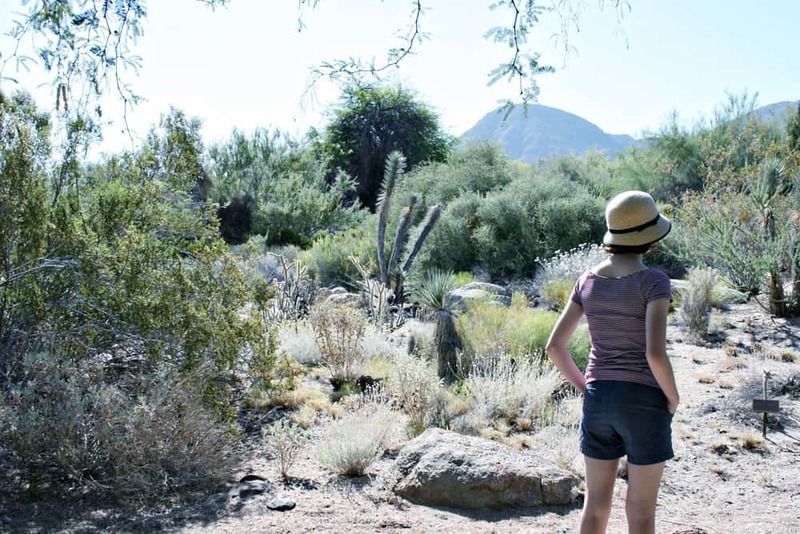 In addition to the gardens and animals, the Living Desert also has nature hiking trails in its preserve. Each of the three trails is varied in difficulty. The Living Desert Zoo itself is very walk-able. We didn’t even bring a stroller for the toddler, allowing her to walk freely on the paved paths and the dirt trails. I do recommend wearing close toed shoes at the Living Desert in Palm Springs. I wore sandals and my feet were quite dusty after walking through the exhibits! If you want to minimize walking or enjoy more of a tour, there is an in-park shuttle service for a small additional fee. Take time for the kids to admire the trains garden. This G-scale model train display is large and intricate with lots of fun interactive areas. Another can’t miss for young kids is Gecko Gulch. 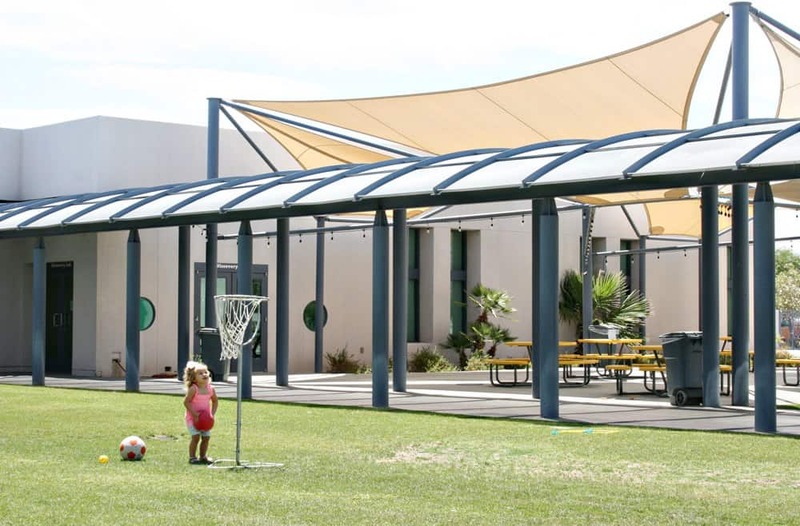 This play area offers plenty of shade and gives kids the chance to run around. 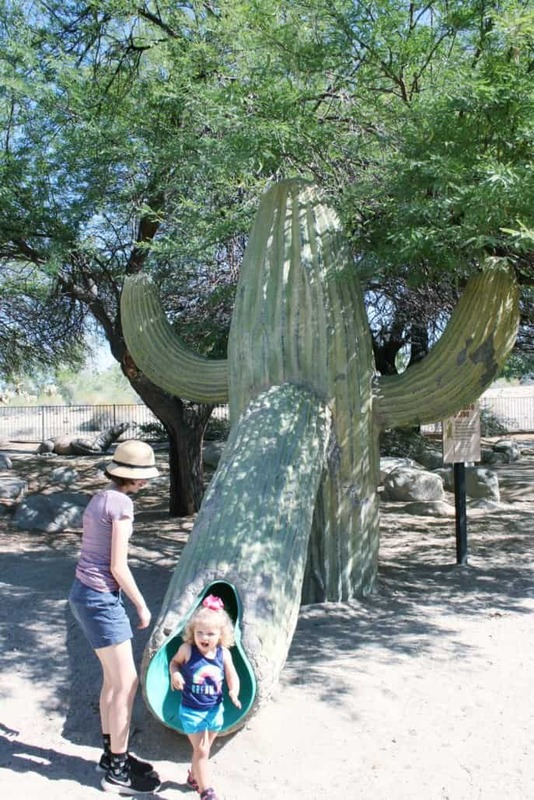 The Saguaro cactus slide was a favorite! 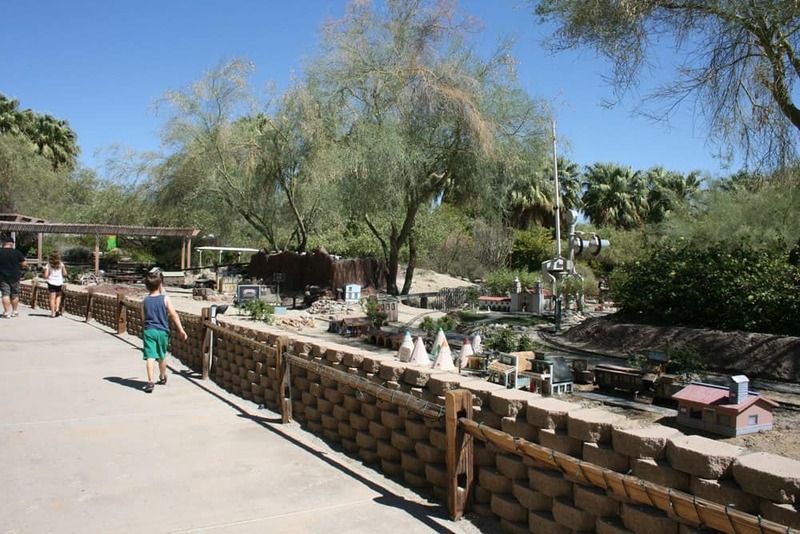 The train exhibit at the Living Desert is a must-see for kids. Note that summer hours are abbreviated. On the day of our visit (mid-June) the park was only open from 8 am to 1:30 pm. Also some activities, like the carousel, camel rides, nature trails and lorikeet feedings aren’t available year-round so be sure to check the online calendar. If you’re visiting Palm Springs in the summer you might wonder how you can beat the heat. 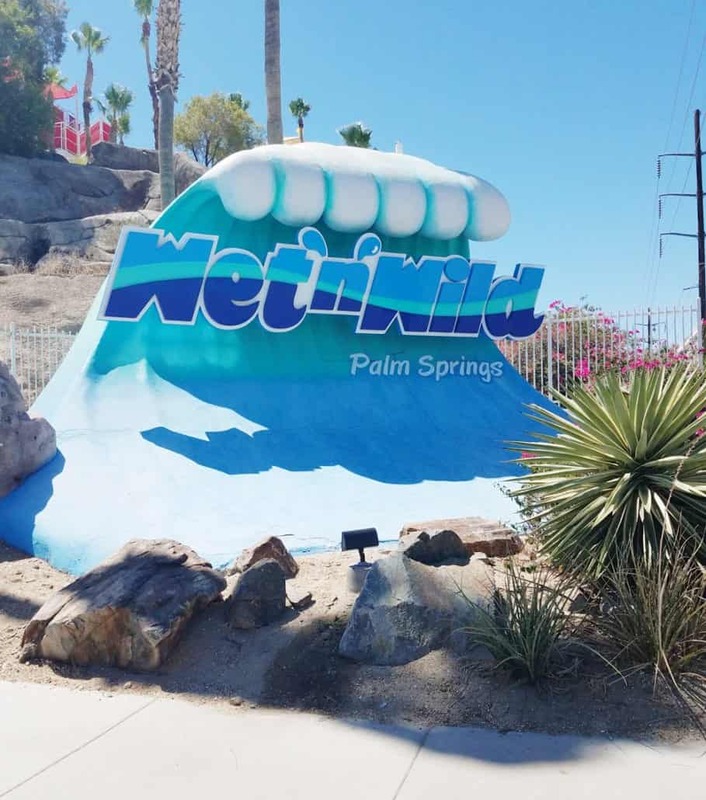 A day at the Wet n’ Wild Palm Springs water park was a great way for us to cool off as a family. 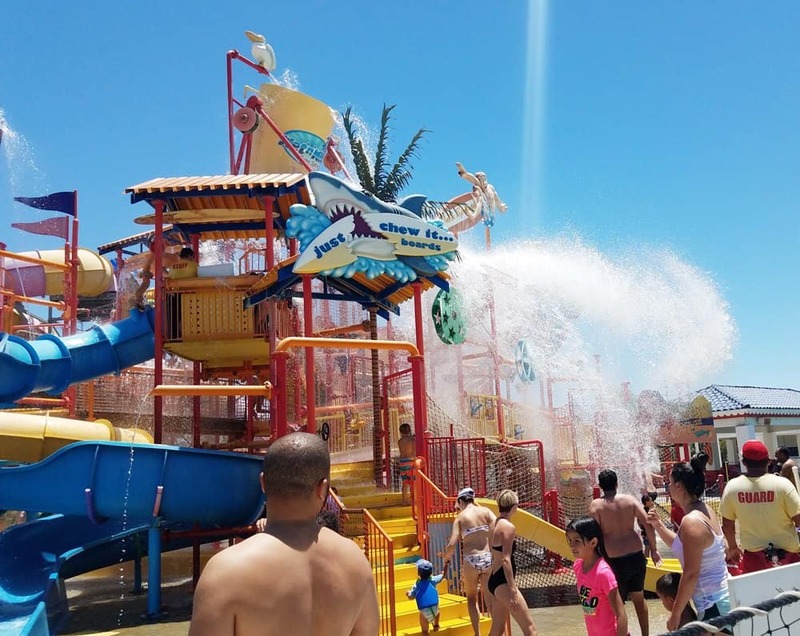 Wet n’ Wild has attractions for everyone, including an intermittent wave pool, lazy river and several family-type slides. Of course there are also thrilling water slides for the adventure seekers too! There are plenty of dining options, offering the usual burgers, fries, pizza and nachos. Ice cream, funnel cake and Dippin’ Dots are choices for your sweet tooth. Unfortunately outside food is not allowed inside the park. However you can leave and return without additional parking charges (just keep and show your receipt) if you want to leave and eat elsewhere. You can bring bottled water, sports drinks and juice inside the park. You’ll also need your own towels. Lockers are available to rent and if you arrive early, grab a chaise under the shade. There are cabanas available to rent at an additional charge. Wet n’ Wild is not open year-round so be sure to check their online calendar before your visit. 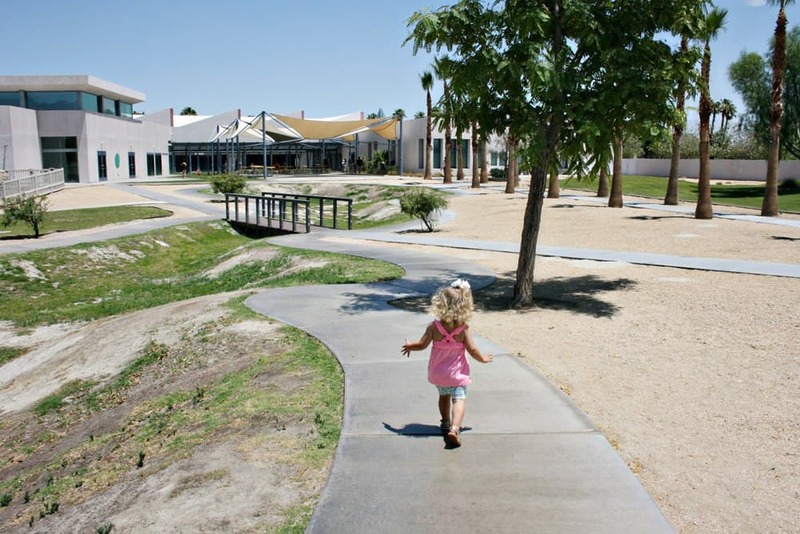 What’s your favorite family-friendly activity in Palm Springs with kids?